Controversial ANC Youth League president Julius Malema blazed into the University of Cape Town (UCT) for a pre-election meeting yesterday (15/04/2009), apparently unfazed at reports that ANC national executive committee (NEC) members are planning to oust him. Wednesday newspaper reported on rumours that NEC members wanted Malema out for his firebrand statements and alleged dictatorial leadership style. But although Malema did not directly address the issue, he did tell hundreds of students that he would return after the elections to celebrate in Cape Town as the president of the ANCYL. Shouting into a megaphone in a 45-minute speech, Malema jumped from point to point, addressing university transformation, his support for ANC president Jacob Zuma and his belief that the ANC would gain a two-thirds majority. Members of the ANCYL and other students used their cellphones to take pictures of the youth boss while songs rang out in support of Zuma. But not all students were impressed. KwaZulu-Natal ANCYL member Mqondisi Magcaba, who is a member of the UCT branch, said Malema had not concentrated on what many students had wanted to hear about. Another UCT student, Zacharia Crumley, who said he was politically neutral, said he had been “disappointed”. “He [Malema] said that money should be provided to the poor African students. He meant black students which I disagree with because it should not be about colour when it comes to education, but about all who live poorly no matter the colour of skin,” said Crumley. An initial lecture theatre where Malema was due to speak became packed to capacity and the venue was moved to the larger Jameson Hall venue, which was also packed to capacity. He said those sent by Helen Zille were “warned”. “When a leader of a small party comes here and holds a meeting we don’t disrupt them, but we can disrupt Zille because it is us who brought down the nonsensical apartheid regime. 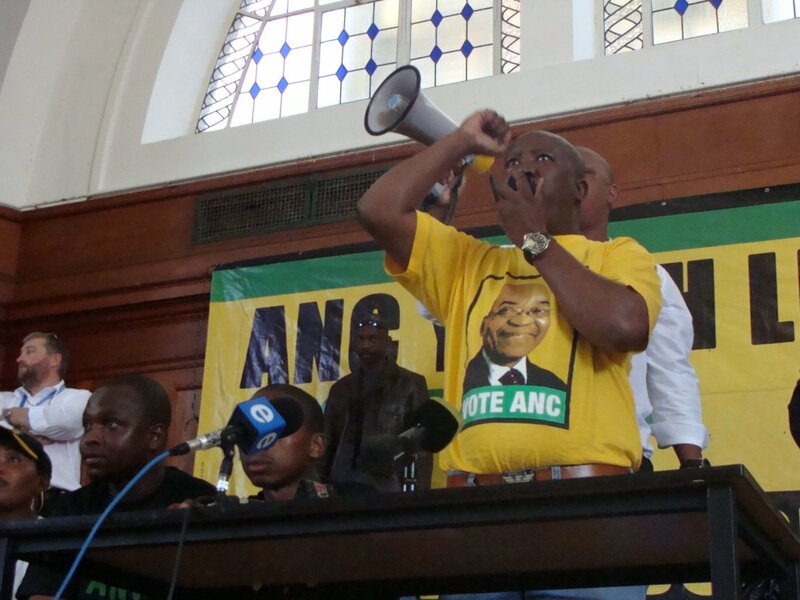 They can all come together – Zille, apartheid general Holomisa, and Buthelezi – they will never defeat us,” said Malema. He said people should start practising calling “JZ” the president of the country and push to ensure that the ANC won a two-thirds majority in the elections. Malema added that on 9 May – the date of the inauguration of the next president – the ANCYL would walk “JZ” to Pretoria where “every soldier” would salute him. “Zuma is going to be the best ever president of South Africa,” he said.